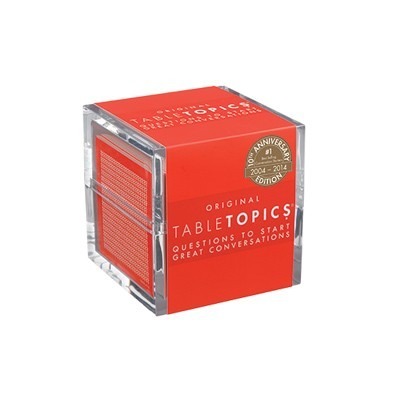 TABLETOPICS Questions to Start Great Conversations are the award-winning conversation starter sets that help millions of people spark fun and meaningful discussions with their family and friends around the dinner table, at parties, on road trips – wherever! What started as a personal passion for great conversation has blossomed into America’s most popular conversation game with over 35 products sold in specialty stores throughout the U.S., Canada and the world. TABLETOPICS is a division of Ultra PRO International, LLC and is headquartered in Commerce, California.